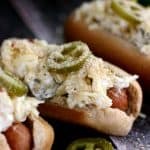 These Jalapeño Popper Mac and Cheese Brats are one of your favorite appetizers dressed up as a main dish. 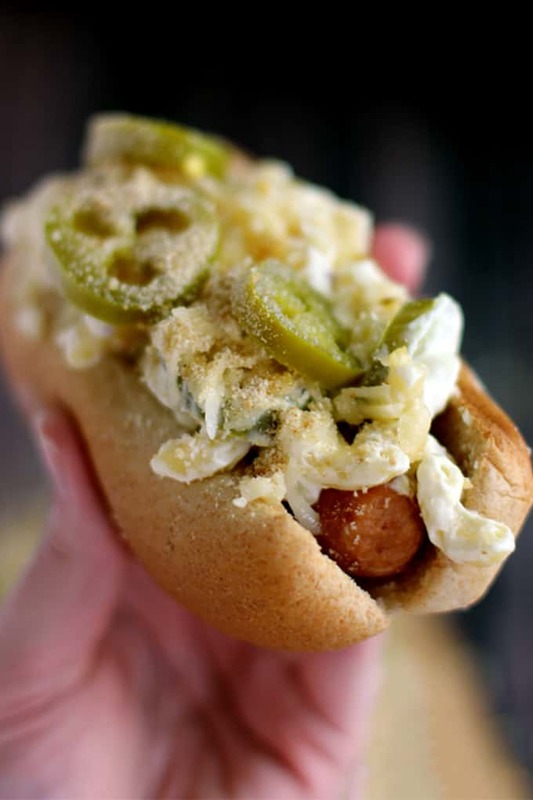 A grilled to perfection brat is nestled into a toasted bun and then topped with the cheesiest, meltiest, tastes just like a jalapeño popper mac and cheese. 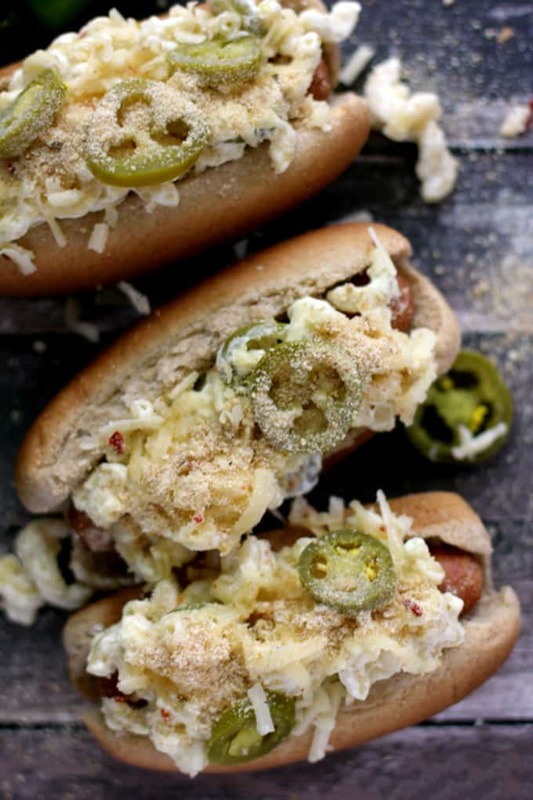 Each bratwurst is then garnished with additional shredded white cheddar jalapeño cheese, pickled jalapeños and toasted breadcrumbs. Finally! It seems like the number of nights we eat out on the patio now outnumber the nights we’re gathered around the dining room table. You know what that means? It’s grilling season! Although I don’t man the grill in our home, I love that grilling is an opportunity for Andy and I to make a meal together. These Jalapeño Popper Mac and Cheese Brats? A perfect example! Apparently you can take the girl out of Wisconsin, but not the Wisconsin out of the girl. After seven years of living in Madison and not sharing a single bratwurst recipe, this marks my third brat recipe in just a few months! You can start the day with my Salsa Verde Breakfast Brats. Lunch could then be my mashup Barbecue Pizza Bratwursts – always a hit. And then for dinner if you really can’t decide if you’d rather have a burger or a brat, you can dig into my Sweet and Smoky Bacon Brat Burger and enjoy both! I’m guessing that means these Jalapeño Popper Mac and Cheese Brats are dessert? If you’re like me, you can’t get enough of that classic jalapeño popper taste, right? Right. In that case, you might also want to check out this creamy Jalapeño Popper Dip as an appetizer. Serve it alongside these genius Jalapeño Poppers in a Blanket and this addictive Jalapeño Popper Guacamole and you’ve got one amazing themed party! 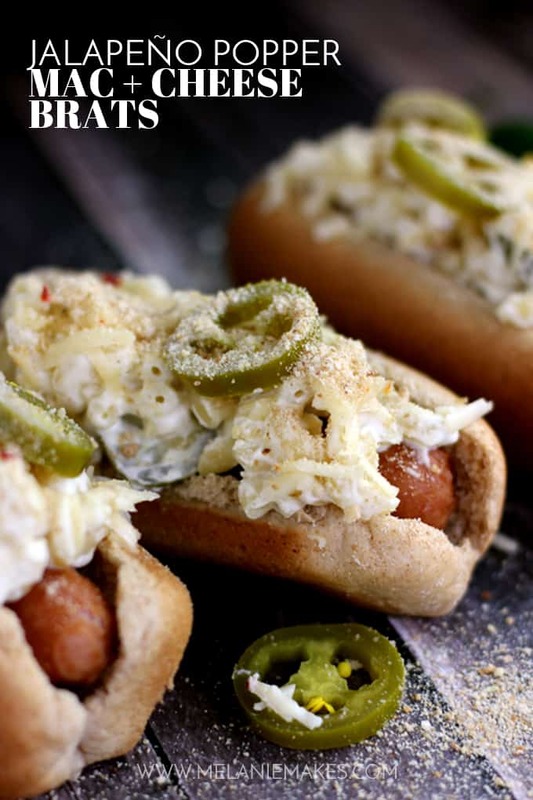 Add these Jalapeño Popper Mac and Cheese Brats to your summer grilling menu pronto. You can bet I’ll be enjoying them again in the very near future. Here’s to many more nights eating dinner with friends and family on the patio! In heavily salted water, cook macaroni until al dente. Meanwhile, in a large saute pan add half and half and cream cheese. Whisk together as it melts to insure there are no lumps. Stir in white cheddar jalapeno cheese until everything is melted together. Stir in jalapenos and yogurt until combined. Drain pasta and stir into cheese mixture. Place brat into bun and top with approximately 1/2 cup mac and cheese. Garnish with additional shredded cheese and jalapenos, if desired, and top with bread crumbs. Good lord girl, this looks incredible! I want to reach through my screen to grab one! Thank you so much, Amy - they definitely are a hit at our house! Dang girl! This are some killer game day food! Confession...I am not really a brat person. But I would definitely get down on these! Not a brat person?! Who are you? ;) I promise you'd love these, Meg! OH MY WORD! I am totally craving these now, Melanie! I can't even handle how amazing this sounds. I love brats and I know I would love that Jalapeno Mac and Cheese, and together it just sounds awesome! It's definitely a win/win on both parts of this dish, Ashlyn - thank you! Come on over, Serene - there's always plenty! I have no doubt it would elevate your veggie dog game, Kacey! I've never tried a brat before! This looks so good!! This is simply a situation you must remedy, Jaren! I love the idea of mac n' cheese on a brat! That looks amazing! Thanks, Tonia - it was such a fun recipe to create! I think our husbands would get along famously, Heather! What a fantastic idea! 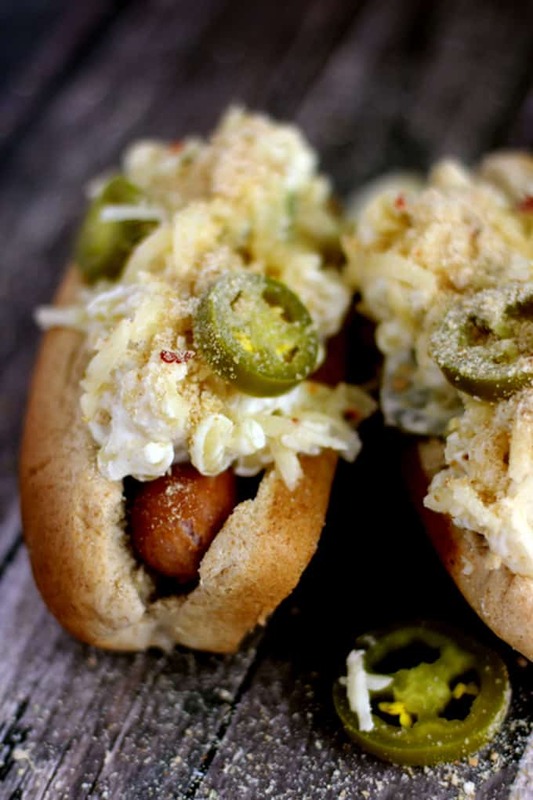 Mac and cheese on brats - I need to try this! You've taken something absolutely wonderful like a brat to a whole new level! Thanks so much for your kind words, Pam! Oh my gosh, this is too good. My whole family would go crazy for these! Thank you, Amanda - I have no doubt they would! These. Look. FANTASTIC!!! I have no other words, except "yummmmm..."
Totally in love with these brats! Perfect tasting vibes happening here! Ohmigosh, these sound positively heavenly! I definitely need to make these for my next cookout! Thanks so much, Kailley! They are perfect for a cookout. I like mine with extra jalapenos! Oh my gosh, my husband would die! haha! These look fantastic! So many wonderful flavors in this! Oh yes, Annie - this is definitely a husband pleasing recipe! Are you determined to make me fat for the summer? Seriously you're brat recipes look so ridiculously good, I may just have to scorn my swimsuit for the season and make every last one of them.P.S. I love that your kids have had a brat but not a hot dog. Raising em right!